Could not fault the cleanliness. Staff friendly and very helpful. The staff work very hard as there was never enough staff to cope with the volume of customers. Only ever one restaurant open for meals. Snacks were available from pool bar during the day. Evening only main bar open with two staff and very long queues! Hotel entertainment team work very hard and good fun. We have to thank Bob he was the main person who dealt with the children. Our boys were 12 & 10 yrs and had a fab time doing lots of different sports in and out of the pool. Bob made the boys holiday which gave us time to chill! If you want a sunbed you need to get up at 4 am-ish. You maybe lucky at 5am but after that I don't think so! Would we go back? - no. If you are going to chill and want sun you will be fine. If you want night-life, don't go here. Not the best for young, single people. the hotel was great i loved it the beach was right by the hotel an pool nice, staff really friendly an the place was always clean including rooms. lots of nice food to choose from i miss it already. would recommend it to anyone i would live there if i could. This hotel is not to be confused with the Royal Nozha hotel situated next door .This hotel was newly reopened after having much work done to it including re modelling the pool . It was clean everywhere a and located on the beach. It had large airy light bars and a lovely reception area.The staff were all in pristine uniforms and helpful ( it was handy to know a little french ) .Everything was free ..water ,alcohol of many types,coffee,soft drinks . Also towels for the beach and sunbeds.There were all nationalites in the hotel but we met lots nice people . Only moan was one lift so if you werent able bodied ask for a room near the lift .Nice clean safe pool.Entertainment was fair the Animation worked hard . We booked this as a last minute cheap get away for a week in the sun. The hotel is quite rundown We had booked a family room and paid a supplement for a seaview. The family room was a good size, clean and modern with plenty of storage space. These rooms are in a separate block to the rest of the hotel. The bathroom was not the best and the toilet did not function all week, despite a maintenance guy spending most of 1 day trying to fix it. we used a bucket to flush it for whole week. The room did not have a seaview and it appears that no family rooms do. Thomsons please note. We were offered a seaview room in the main block (with only 3 beds) but when I saw how dilapidated it was I was thankful for the room we had. The room was cleaned daily to a good standard but we found the overall appearance of the hotel quite grubby. The food was fine, lots of choice if you are prepared to try different foods.My kids were fine but they are pretty good at trying new things. My only complaint would be that the breakfasts werent very good and that the food was invariably lukewarm/cold. We didnt go hungry though and there was always plenty of wine to wash it down. The hotel is in "old Hammamet" there is not much else around in the area and it is pretty rundown. The beach is lovely, sea shallow and safe for kids and there are lifeguards, police patrols. No hassle on beach from vendors. Outside the hotel you do get pestered, particularly in the medina but a polite no thanks does the trick. It helps to speak a bit of French, the Tunisians all speak it & I'd say 60% of the guests in the hotel were French. The hotel runs a kids club mine went once & they were the only ones there so didnt bother again. Staff varied from the very friendly (maids, waiters in restaurant, animation team) to the very miserable & unhelpful(reception & all-incl male bar staff). Entertainment - plenty going on during day if you like organised games, aqua aerobics etc. at night the kids disco went on for a full hour and we heard the same irritating songs night after night.This was followed by nightly bingo. We didnt actually see any other entertainment as it started far too late for us - there is a disco til 2am pleased to say we only heard it on the first night. Overall ok for a cheap week away with guaranteed sun. Would not want to go there for main 2 weeks hol. This hotel does not deserve to charge its guests all-inclusive prices, essentials like mineral water was limited, for example you could only get a bottle of water if you were going to the beach, if you stay by the pool or in the hotel you can only get a plastic cup full at a time, resulting in many trips too and fro, if you frequently ask your child to get you a cup the staff will pull them saying they drink too much. When you get served at the bar you sometimes get asked your room number which is odd because you are issued with a wristband to show staff you are all-inclusive, we found this quite unnerving esecially as there were lot of thefts happening at the time we were there, if you say out loud your room number your obviously not in your room are you? Ice creams are only availabe between 3pm-6pm or you can purchase them outside these hours (which you shouldn't have too being all-inclusive) A couple of the bar staff had the most horrible attitude towards us, but theyr'e were also some really nice staff who would bend over backwards for you, even thought they were breaking the rules. The entertainment team were great with the kids. Snacks were limited also, if you don't like sandwiches with cheese, lettuce, tomato and salami then your stuffed, you could have a pancake instead I suppose. The snack bar in the evening was often left empty which meant it closed early, to me that meant the guests were obviously hungry. Both me and my partner had upset stomachs on week 2 but kids were ok, making us think drinks could possibly be watered down, took another 3 days of returning home before stomach settled. You can only get soft drinks during the day at the beach bar if you are all-inclusive, you can buy alcoholic drinks there but beware they rip you off. 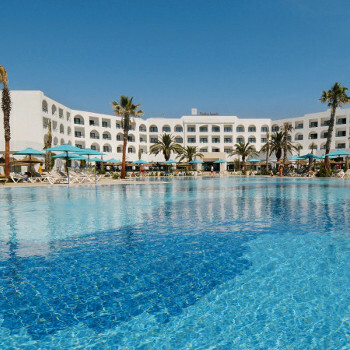 Hotel is in North Hammamet so quite old and very quiet, not much to do outside hotel, there is a lovely restaurant outside to the right, you'll probably use it as the food is very repetative, kids menu was a let down too, pizza, chips and pasta every day. There is a microwave available, you will use it as food cold, a lot of flies in restaurant too. Kids loved the waterslides at the pool. The hotel is ideal for a beach, pool lazing about holiday, but not good if you like to venture and explore or like nightlife. I would not reccommend going to this hotel if you have paid a big sum of money for your stay. Is worth a last minute cheap getaway. Royal nozah beach is more up market and newly renovated completly different to the nozah beach next door needing a face lift and a good clean!! Pictures on the internet are of the royal not nozah. Animation reps were great fun, hardworking all day long. Food was okay. Depending on what you like. If you like your typical english food, dont bother going all inclusive!! Pool is a nice size but not regularly cleaned!! Rooms are very small, not ideal for more than two sharing, as no wardrobe draw or cubboard space, and nowhere for cases. Just got back from our 2 weeks hol at the Nozah Beach hotel, our kids had a great time. The hotel is right on the beach, free sunbeds if your all inc as we were. We had 2 four bedded rooms which were clean and spacious with 2 English tv channels. We had rain for 2 days and a impressive thunderstorm one night unfortunatly 1 of our rooms 6015 flooded but the hotel staff moved us to another room so no problems there. Food was good although a bit repeatative but you would never go hungry, the kids food was poor the same every day lunch and evening. I hope they improve this because this is a great hotel for families. Mini disco at 8.15 and bingo and entertainment goes on till 11/11.30 so not too late. The entertainment team are all Tunisian and they work really hard, they love the kids and they were in tears as we left. They are called the saboutage team and the kids love them. There is a mini club too for the kids. Everything about Nozah beach was great although we think this is the first time a English tour operator has been there as the hotel was mainly for Germans and French so the hotel staff do not speak much English but this was OK as they were all friendly. The only thing that let this hotel down was its location..... great for the beach and watersports but not many shops ect outside. This was our first visit to Tunisia and this hotel, and it will not be our last. Food was varied each day and covered even the fussiest of eaters as our children are. The rooms were cleaned every day and the towels were changed daily too, children's entertainment was brilliant, we will certainly be back again!